Is there an easy way to rearrange or move the icons in the Unity launcher? It looks like the only time that you can choose where an icon goes on the unity launcher, is when you add it. Is there a way to rearrange the order of an icon after it has been added? Click and hold the application's launcher icon, and then drag it up or down. How to rearrange icons in Unity Launcher? Just drag the icon out of the Launcher. And then just drop it back in the Launcher anywhere you want. In Ubuntu 11.10, dragging to the right didn't work for me. When I click an icon and hold the mouse button down for one second without moving the mouse, the icon drops down a few pixels. After that, I can drag it up or down the list to change its position. You will need to drag the icons out of the launcher (right direction) and then place them wherever you want them to be positioned. You do not need to ctrl-click in Unity 2D; just click the item and hold it for a second without moving the mouse, and then the icon will detach and now it can be dragged to a new position and left there by releasing the mouse button. Note that the icon will automatically push down some other icons when detached in the desired position. 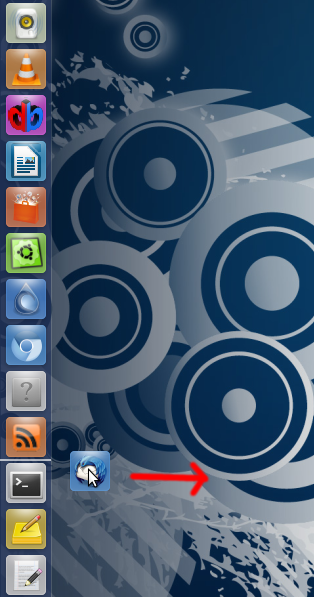 You can also control-drag the icons in the launcher straight up or down instead of dragging out and then back in. Yes. Click and hold a launcher. Pull it out to the right so it detaches. Drag it up and down and watch the little marker in between the other launchers. When you let go it will insert where that marker is. Launchers have to stay within their 'group': the workspaces, files and folders and applications are one group (they have letters when you hold super) and the other icons are also 1 group (those have a digit when you hold super). When you have a lot of icons on your launcher, it might be a good idea to not only rearrange these, but also use the Unity Launcher Folders Application. It is third party software, but very easy to use and install. That way you can not only rearrange your icons on the launcher, but also create folders in which you keep different kinds of sofware categories such as browsers, office related programs, games, paint and draw and video for instance. This application helped me a lot. For the rest, I agree with all the users before me: just drag it up or down! How to change the size and order of the launcher panel? How to reorder tray icons? Add TeamSpeak3 to Unity launcher? How to move Unity launcher icons to desktop? Why does dragging and dropping on the Unity launcher sometimes moves the icon and sometimes slides all icons? How can I dock a specific System Settings as an icon to the Unity launcher?